Since becoming a yoga instructor, I’ve learnt an awful lot about how important it is to keep your body healthy. Even though it’s always nice to enjoy a piece of cake now and again, what if there was a recipe for a cake that you could eat whenever you want (within reason) and without the guilt? Here is my recipe for deliciously light and fluffy vegan vanilla cupcakes with a creamy vanilla vegan butter cream icing with sprinkles…. Set the oven to 180 degrees C and line a cupcake-baking tray with paper cupcake liners. In a clean, dry bowl add the vegan butter and beat for 5 mins. Add the sugar to the butter and mix until texture becomes light and fluffy. Add the vanilla extract (make sure not to use essence) and stir. In a separate bowl add the flour, baking powder, salt, bicarbonate of soda and sprinkles (to your taste) and mix with a spoon. Add the dry flour mixture to the butter and beat until smooth. Add in the milk and mix together until all the ingredients are combined. 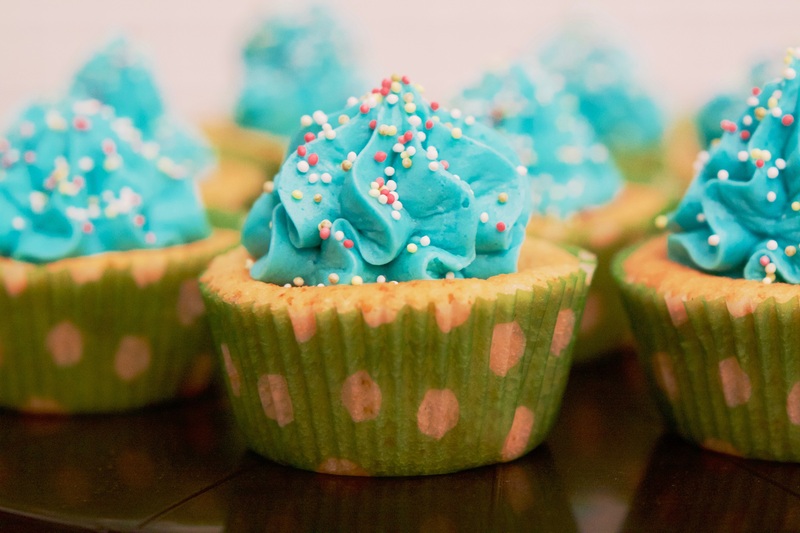 Using a tablespoon, spoon the mixture into the paper cupcake liners until they are ¾ full. This will allow for the cupcakes to rise in the oven. Once all the liners are filled, place them in the oven for 25 minutes, or until they spring back to the touch. Once they are ready, remove the cupcakes from the oven and leave to stand in their baking tray for 5 mins. After 5 minutes, remove the cupcakes from the baking tray and leave to stand on a wire cooling rack until they are completely cold. Whilst the cupcakes are cooling, now is the perfect amount of time to whip up some delicious vegan butter cream. In a clean, dry bowl add in the vegan butter and beat for 5 minutes. After 5 minutes, add in the icing sugar a tablespoon at a time – trust me you’ll want to do this part slowly as the icing sugar can end up everywhere, if you go too quickly. Mix well with a spoon and add the blue food colouring, vanilla extract and the milk. Mix well again until all of the ingredients are combined and pipe onto the top of your cold cupcakes. Sprinkle some multi-coloured sprinkles on the top to finish and there you have it, my deliciously fluffy vegan vanilla cupcakes with vanilla vegan buttercream. Hope you’ve enjoyed this recipe; let us know what you think in the comment box below.